Dinner On The Lake is back! Enjoy a refined menu in the open air while the sun gently disappears behind the trees. Throw in an even longer opening, a brand new super deluxe raft, not one but two charming locations and the gastronomic journey can begin. For the 4th year in a row Dinner On The Lake went on expedition and selected two top locations in the middle of quiet nature. The pop-up concept lands on a quiet piece of nature in Ghent and explores the green banks of Maasmechelen. Very soon Dinner On The Lake will appear in an idyllic part of Amsterdam. 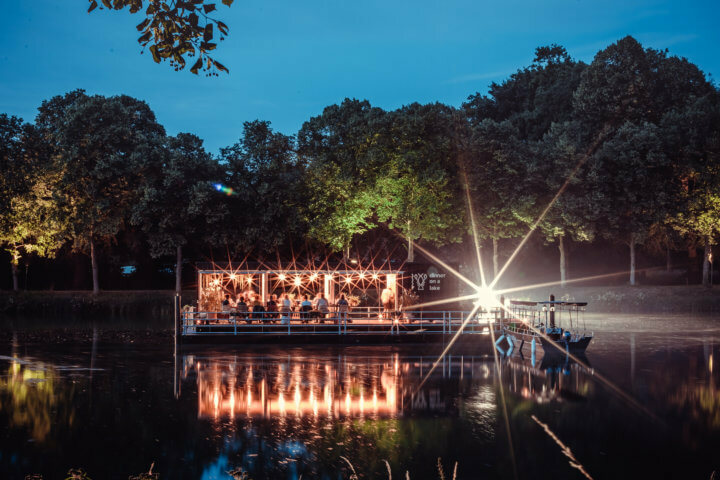 Dinner On The Lake will for the first time be working, among others, with Belgian star chefs to take the culinary level higher than ever before. Are you a bit sceptical about the Belgian weather? The raft can also be completely closed this year, heated and cooled down. As a result, Dinner On The Lake will drop its anchor a little longer so you can taste this culinary experience from May until September. Not to be missed! Looking for an atypical, but magical event location? Those who want to enjoy undisturbed and party in the green under a starry sky, can now book the private piece of paradise on Monday or Tuesday (up to 40p. ).